Trinidadians love mango chow and I am no different. 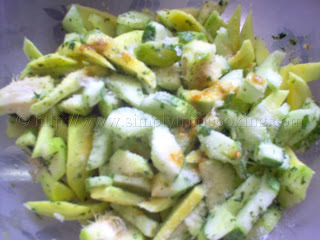 This simple appetizer is great during hot evenings, with good company. 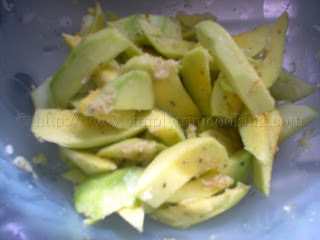 It is seasoned green or half ripe mango with a little pepper (no cooking is required). 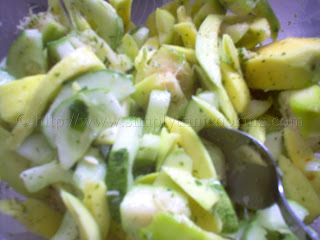 Today we decided to add pommecythere (or golden apple) and cucumbers to the chow because we wanted to make a big bowl. 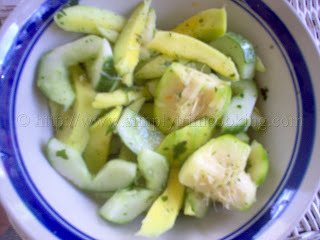 This mango chow has mango, cucumbers and pommecythere. Now that mango is in season I make this often. 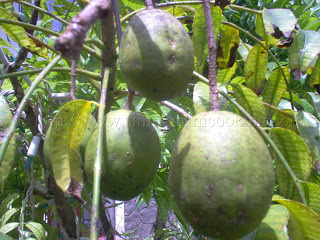 The mango tree and pommecythere tree (spondias cytherea) is always at hand and laden, so I don’t have far to go, literally at arms reach, when I decide to make a chow. So if you have a salty, sour tooth like me instead of a sweet tooth try a little chow, you won’t regret it. If you’re not used to lots of pepper keep a glass of water at hand; it’s going to be hot!! 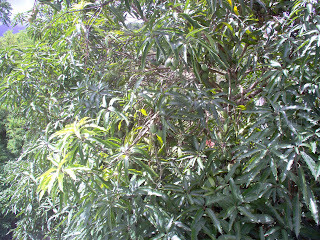 but the foliage has hidden them . Please note we did not put exact measurements because everyone have their own style and due to that you will have varying amounts of, any of the ingredients. So, let your taste buds be your guide. 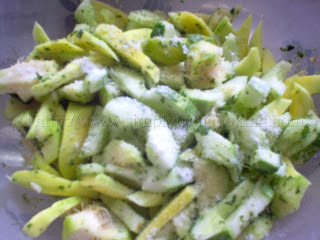 Peel the green mango and pommecythere, and chop into thick strips. 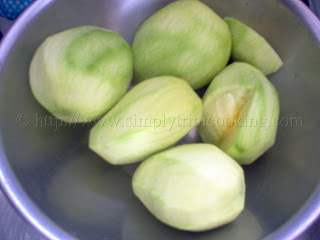 Coming up next, a little about mangoes. See you soon. What is Chadon beni? I don’t know if I can get it around here. Does it resemble anything? Sounds delicious. I love small dishes like this that don’t require cooking. We’re having a heat wave.
. As for any herb that is close to it you can try cilantro. On one site I found it said you can find chadon beni at Asian Supermarkets. I like your use of cucumber in the chow. I’ll have to try that.